Samsung Gear S2 is very close to being replaced by the new Gear S3 smartwatches that already made their debut worldwide. That's probably the main reason the wearable device has had its price lowered, and it's been the subjected to many discounts in the past few months. If you can't afford the new Samsung Gear S3, but don't want to pay the full price for the previous model, how about getting a Gear S2 for less than $100? 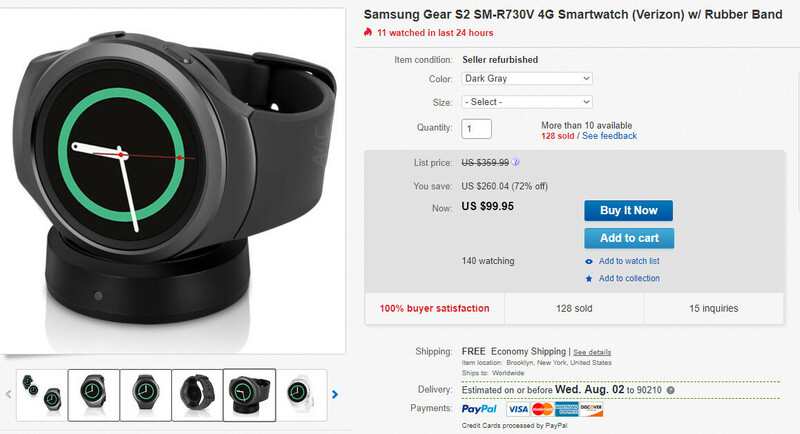 An eBay seller now offers Samsung's smartwatch for just $99.95, which means you'll be saving around $200 when you buy it. There's a catch though, as the eBay seller offers the Verizon model only. Even so, the US carrier has the Samsung Gear S2 up for purchase for $299.99 or $249.99 on two-year agreements, so the eBay deal is much better if you don't have anything against the Big Red. It's also worth noting the eBay seller has both Dark Gray and Silver / White variants available to choose from. If you live in the US will also get free economy shipping, but you'll have to pay for anything faster than that. Don't have a issue removing phone from pocket. Sometimes don't even wear a watch since phone can tell you time and other info. But the real issue is battery life on these gadgets. Not to mention the Verizon network. Never again. Piss off Verizon. I've had a gear s2 since 2015, I love it. I love that I can hang up on Spam calls from my wrist. I love the fitness features. I love that it tells time. I think it is a great device, except for the fact that it does not have a speaker. When I'm on the treadmill, I'd love to be able to answer a call from my wrist and let someone know I'm busy. What happens is that my watch notifies me that my phone (which is in a locker about 100 feet away) is getting a call. But, I cannot do anything about it. Cannot wait to replace this watch with one that has a speaker.